What Causes Big Rigs to Jackknife? When a semi-truck or 18-wheeler jackknifes, it can do immense damage to nearby vehicles and shut down highways for hours at a time. These catastrophic accidents can often be prevented by careful maintenance and skillful driving on behalf of truckers and trucking companies. Learn more below about what makes tractor-trailers and other large commercial trucks jackknife, and how these serious truck accidents can be prevented. When a truck jackknifes, the powered wheels in the cab or tractor portion of the tractor-trailer stop or skid off to the side, while the non-powered wheels in the trailer continue to move in the same direction as before, causing the truck to fold in on itself like a jackknife. This causes the driver to lose all control of the vehicle. If the truck is moving at a high enough rate of speed when it jackknifes, this motion may also cause the truck to roll over. There are numerous potential reasons that a tractor-trailer might jackknife. One cause is a failure of the carrier company to properly maintain the braking systems of the truck. 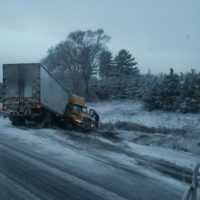 Should the brakes lock up unexpectedly or fail to stop the truck safely in inclement weather, the truck could jackknife. Another cause is improper loading of the truck’s trailer. A truck that is carrying a very light or poorly-distributed load could lose traction, making a jackknifing accident more likely. Truck drivers also have a duty to exert the utmost care and attention to driving in a way that minimizes the risk of jackknifing. When roads are slippery with rain or ice, drivers must drive slowly and carefully to minimize the risk of skidding, which can escalate to jackknifing. Drivers must also take care not to brake suddenly, but instead to brake slowly over as great a distance as possible. Drivers must be especially careful to avoid braking or decelerating on a curve. An experienced truck accident lawyer can help you compose a case for damages if you’ve been injured in an accident with a jackknifing trailer. If you or someone you love has been injured in a large truck accident in Washington, speak with an attorney to find out if you have a claim for money damages against those responsible, and contact the experienced, dedicated, and effective Vancouver personal injury attorney John Lutgens for a consultation, at 360-693-2119.